Just wanted to wish everyone a very happy New Year. I had great plans this week - to finish decorating the room that I had finished painting last New Year's Eve. I know, I'm a little slow, don't stick to one project, etc., etc. But I did make headway, and the whole business is taking much longer than I thought, because it's not like there's nothing else to do at this time of year. Guess I should start at the beginning. This used to be my son's room. It was painted black. Yes, I'm stupid. I allowed black walls in my house - my only stipulation was that the trim and ceiling remain white. Those black walls then became chalkboards for all the budding artist friends that came to call on the room's inhabitant. Son moves away - room becomes a place to dump things that don't seem to have a place. Well, it didn't help that the moving out process took years, literally. Last year I finally decided to claim the room as my own. A lovely room where I could sit and watch movies, do my hand sewing, read - that was the vision. Painting the walls was a bit of an ordeal, but I survived. The paint I chose was called "biscotti"- yummy (if you haven't notice, I tend to have a thing for colours named for food). I dragged back the bed that had been banished, due to necessity of keeping mattress on the floor. I unearthed an ugly pink armchair with potential. I threw some odd remnant of fabric on the bed "just for now" and there things stayed. The room became the dog's favourite place to lounge. You're getting the picture? It was slowly becoming the dog's room, not mine. The problem was that I envisioned robin's egg blue fabric, and I did find what I liked, but this year there has been no budget for the amounts of yardage that I had calculated. Shame on me! It's not like there isn't all sorts of fabric to be used in this house. So this has now become the zero-budget decorating project. It's a sort of challenge to myself. It's taking longer than I thought. (I said that already, didn't I?) So here's what's done to date. I covered the bed in a piece of fabric that was left over from a costume that I made a few years back. Every flat pancake of a pillow in the house was rounded up. The pillow slips were all made from assorted odds and ends that were lying around - some pieces new, some pieces vintage (they were doing no good lying around in a trunk in the basement, as they were). The rug (if that's what it is) was also lying around with no designation. It's a little difficult to photograph white on white, but you get the picture. I did spend some time making things "pretty". There's a creature in this house that thinks that this is all for his comfort. Not! Wishing everyone a very, very merry Christmas! I was going to be a poop this Christmas, due to the decided lack of offspring in the house. I was going to only put out a few nick-knacks and call it a day (season?). Then when I woke up yesterday morning, I just decided that sitting around, feeling blue, was not a good way to be. A tree was what I needed to get me moving and into the spirit of things. A might late for tree hunting, but I was determined that if it was meant to be - there would be a Christmas tree out there somewhere for me. I started at the grocery store nearest me - no trees left. A little further down - a lot where a community group had been selling trees, where I had seen trees just a few days ago - no trees. I headed down to the grocery store where a friend of mine is the floral manager. Perhaps... As I was trolling past the store - there was one lonely tree, leaning against the wall, looking a bit like a Charley Brown tree, but a tree none-the-less. Miracle of miracles, even a parking spot opened up for me. I ran into the store, found my friend, who promptly told me that I did not want that tree. Yes I do! No you don't! Yes I do! So for the princely sum of $5, I acquired my tree. 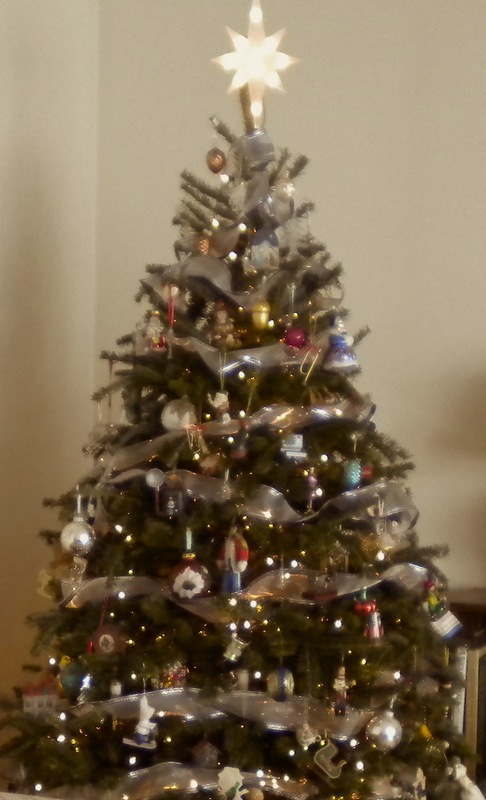 Its top was broken off, but who cares - I won't have to stand on a chair to put the star on. It's even a Frasier fir - my absolute favourite! Last night I brought it in, put it in its stand. Now the whole living room smells like evergreen. May-be it won't be so bad a Christmas after all. Now my countdown has started. I've finally started adding a few decorations to the house. Why am I not stressing like everyone else in these last days before the 25th? Well, because I have an extra 2 weeks to get my act together. 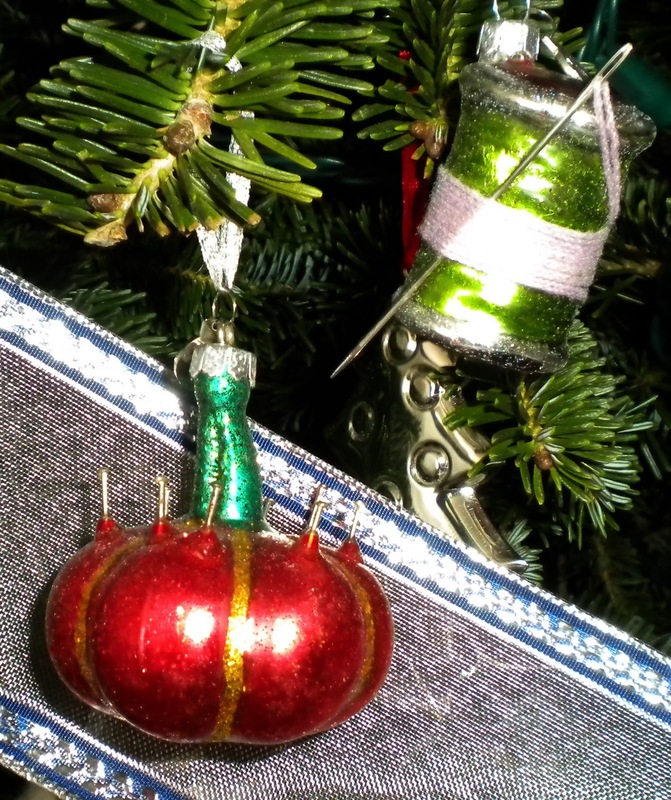 We celebrate Christmas on January 7, which is actually December 25th by the Julian calendar. A little confusing, I know, but that's what we're used to. I grew up with celebrating Christmas two weeks later than everyone else. My children grew up with the same. We celebrate in a similar manner to everyone else - just later. Oh, yes, and church services are a huge component of the celebrations. We gear all our preparations for the day of - no celebrating early. Of course, it's still fun to join in with the rest of the world and participate when invited by friends and neighbours. My outdoor decorations did not go up as usual, because of the huge amounts of snow. I hang garlands with lights on the railings of the front porch. Not this year - the railing is somewhere under the mountain of snow. I did hang the wreath on the door. May-be I need to rethink the outdoor decor for future if we are going to continue this pattern of snowfall. The Christmas cards were beginning to pile up on the table, so it was time to put them in their proper place. The original idea came from Martha Stewart, as I remember, from many years ago. I don't have the budget, though, for incredibly wide silk ribbon, long enough to wrap around the door. What I did have was this piece of polyester silky stuff that you couldn't pay me to use for clothing. I cut it to a width that I thought would look decent (too skinny and it just wouldn't look right), double thickness, and did a rolled edge on the serger along both edges. I found these round paperclips at Staples, and they're sewn on every few inches down the length on one side. I seem to remember that Martha had brass-coloured paperclips, which would probably look a whole lot better, but you have to go with what you can find. So now I'm off to pop the rest of the cards into the paperclips. I've been sewing a few Christmas gifts, just like everyone else, but I'm not showing until the gifts have reached their recipients. I've been sewing "home decor" - I'll share that with you later when I've put everything in place. In between, I've been sewing some "instant gratification" projects - namely t-shirts. I've come to realize that I tend to run out of layers to wear before I actually accumulate enough dirty laundry to make it worthwhile to run the washing machine. First I made a turtle neck using the leftovers from my daughter's t-shirt. I used an ancient Kwiksew pattern for a t-shirt, but I have sliced and diced it so that it no longer resembles its original self. Namely, I raised the armholes considerably and narrowed the sleeves and body, and I think I got a fairly decent fit without it being skin tight. This fabric is very soft and drapey, and quite fine - excellent for layering under a sweater. I used the width of the neckband, but cut it 12 inches long, to then fold in half to make the turtle neck. I never fold my turtle necks in half, like normal people - I just scrunch them up on my neck. Guess I should also work on the "what-to-do-with-my-face-while-waiting-for-the-timer-to-click". I was looking out the window. Don't remember what caught my attention. While I was all set up with black thread in the sewing machine and the serger, I decided to make more black tops. I bought all that was left on the bolt of this knit ("unknown fibres" - Fabricland's favourite designation, it sometimes seems). I think that it's rayon with lycra. It's very fine (is that what they call tissue weight? ), very soft, and an absolute horror to sew. After all that you will see here, I still have over 6 metres left, so I felt that I had to get comfortable sewing it, and having slowed down a bit, taken my time, it turned out fairly well. Another t-shirt (regular neck) using the same pattern as the previous turtleneck. I stole Eugenia's idea (thank-you Eugenia!) for a removable cowl neck, and made an endless scarf. 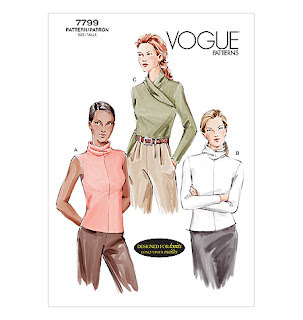 Next I used my well-used Vogue 7799, one in the same black, using the turtleneck view. I cut the front on a fold, to omit the front seam, and I have narrowed the neck considerably. (It was way too floppy in the original.) It looks somewhat like the Burda turtlenecks that a lot of people have been sewing up. Then I finally switched to brown (not than anyone can tell with the weird way the colours turned out in the pics). This is (obviously) the view with the collar. It's a fairly fine knit, but with a bit more body than the black, so much, much easier to handle. I like this style for winter. It's high enough on the neck to feel cozy and to keep the itchy wool sweaters at bay, but it's not a turtleneck, which can get overly boring at times. I know - boring, boring boring. Sometimes, though you just have to bite the bullet. I still figure it takes a lot less time for me to sew these, than to attempt venturing out to the mall to buy. Besides, I'd more than likely have to make alterations, and in that case it definitely is saner to just sew from scratch. I admire all the lovely knit tops that everyone else is sewing, and I know that I should branch out in my knit sewing, but at this point in time my only thought is whether something will work in endless layering to keep me warm. I was going to post this days earlier, but for some reason the pictures just weren't coming out right. So - you won't get to see me in the whole suit, but I can show you some bits and pieces. Once upon a time (well, actually just a few years back) I made a navy suit. Lovely wool with a woven stripe. Pants were the bottom half of the suit. Every time I wore those pants I couldn't wait to get out of them. A more uncomfortable pair I have never made in my life. Classic case of overfitting. A tweak here, a tweak there, another tweak somewhere else, and before you know it - the world's most uncomfortable pants. The jacket got worn with one other pair of pants that I have in a very dark navy wool. Every so often I would yet again wear the pants, only to remember why they generally languished in the closet. I still wanted a whole suit, because - well - just because. Then along comes this brilliant idea - if trousers are drafted from a skirt sloper, then I should be able to turn the trousers back into a skirt with no problem. Right? Wrong! First I undid the inseam and tried to make straight seams front and back. (Don't forget that I had a fly front zipper in there that I really didn't want to take apart.) Didn't work. Stupidly, I lopped off some 14 inches from the bottom of the pants. After some point, when I really should have called it quits, I finally took apart all the pieces. I pressed and steamed and got rid of any evidence of old seams. I laid down the pattern pieces for my favourite strait skirt. Guess what - not enough width in the legs to make a quarter of a skirt. Saner people would just give up at this point. I was DETERMINED that I was going to have a matching skirt to this jacket. I did it! One navy skirt with 2 pleats in back and side zipper. I cut the side pieces according to the pattern, measuring the amount that I was missing from the centres. Then I pieced those bits that I had cut off the bottoms, lining up the stripes and stitching in the middle of one of the stripes, to keep the stripe pattern consistent. In the front I ended up with just a straight panel. In the back I needed pleats for walking ease, so I made one on either side of the inset panel. I reused the zipper that I had, and (should I admit to the fact that my thread wasn't exactly matching?) I did a hand picked zipper so that I wouldn't have thread showing. The little decorative hook matches the hooks on the jacket closure, so it went on the skirt. The pants had no waistband, but I decided to add a very narrow waistband on the skirt. By the time I got to the lining I decided that I had had it with messing around with preused pieces of fabric, and rummaged around and found some rayon lining. Because I cut the lining according to the "normal" skirt pattern I had a back seam, so I took the easy way out with it. Was it worth all the trouble? At times I thought I must be absolutely crazy. I could have made a number of skirts from start to finish in the time it took me to wrangle this skirt from the existing pants. But now I do have a whole suit from one fabric, and to me it was worth the effort. Here's what else I've been doing this week - cleaning snow. Lot's of snow. This is my car on Monday night, when it finally stopped snowing enough to get out to shovel. Average depth of snow in my driveway was mid-thigh. On Tuesday we had more snow - this time only knee-high. Wednesday was a really easy day - only ankle deep snow. And why was my car not in the garage? Because I procrastinated for eons and didn't sweep the floor in the garage after the roof had been done this summer. Needless to say, now the garage has been swept. The car resides in the garage, and it's much easier to deal with the snow, which just keeps on coming. Maybe I should be drooling over snowblowers instead of fancy sewing machines! How do your boots stand up? It's snowing. Boot season is here to stay for a while, and even though I have no-one but myself to yell at about boots in the front hall, for some reason they manage to take over the entryway. I kick them off as I come in, and for some reason they have not yet learned to march themselves right into the closet! Honestly! But once I do put them into the closet, I have a trick for keeping them standing at attention, instead flopping about. The original idea for these boot holders came, I believe, from some magazine article on closet organization. The idea was to keep boots upright in the closet. In the article it said to insert rolled up magazines into old socks, pop them into your boots and keep the boots from toppling over. Very unappealing to my aesthetics. Old socks? My boot holder-uppers. (I love making up words.) So much better looking than old socks. Easy to make. Good way to use up scraps of knits that have nowhere else to go. I used a red ribbing that was never going to find its way onto a garment and black velvet ribbon that was kicking around. I'll give you the instructions, in case you wish to make some. Cut 2 pieces of the ribbing (or any other knit) - 7 1/2 inches wide by 18 inches long. I made a lettuce leaf edge on the serger along one short end, but you really don't even need to do this. Fold in half. Stitch along the long edge to form a tube. Gather up the unfinished edge and secure about 1 inch or less from the end with a rubber band. Turn right-side out. Roll up an old magazine. (No - not the sewing magazines. You don't want to be looking for Burda patterns in your boots!) Insert into "stocking". Gather up top edge. Tie with a ribbon. Pop these into your boots, and you will have the smartest array of boots of any closet in town. Some companies call these embellishers. It looks like a sewing machine, but instead of one needle, there is an array of very sharp barbed needles. As the needles go up and down, they lock the threads of the fabrics that they are going through. No thread is used. Almost any fabric or fibre can be manipulated this way. Probably the most common thing to felt is wool, but a lot of different bases can be used. I've played with embellishing polar fleece, denim, and silk. One of the samples that I have at the store is an evening bag, where I felted silk chiffon onto silk dupioni. If I ever bring it home - I'll show you.